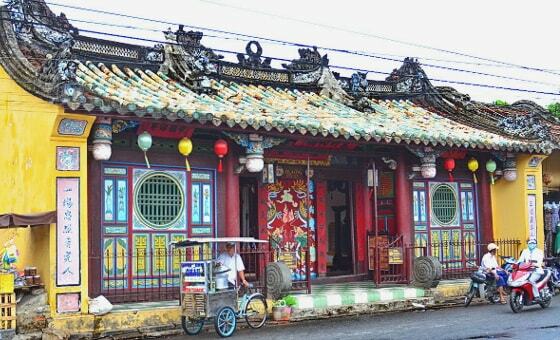 Quan Cong Temple (also known as Chùa Ông in Vietnamese) is located in the center of the ancient town of Hoi An. Having positioned and beautiful architecture, unique, this ancient temple is one of the top places must-see when visiting Hoi An. 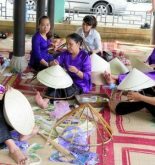 The temple was built in the mid-17th century by both Vietnamese people and Chinese people – who live and do business in Hoi An. Because, Quan Cong was a historical figure have lots of fans and revered not only in China but also in the East Asian countries, influenced by Chinese culture in history. According to Wikipedia, Quan Cong (? – Died 220) is an outstanding general of the state Shu Han during China divided into three territories. He is renowned for loyalty, sacrifice to the state. 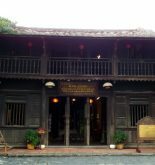 For that reason, you can find the shrine Quan Cong in Vietnam, Taiwan, Malaysia and Singapore. The Quan Cong Temple area has 4 buildings are arranged in the shape of “mouth” word in Chinese “口” (similar to the rectangle): an annex building in the front, two side corridors, courtyard in the middle, and the main building at the last position. At the center of the main building is the Quan Cong statue, portrayed majesty but bright. 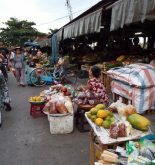 The two sides are the statue of Chau Thuong – the loyal maid and brave, and Quan Binh – son of Quan Cong. Next to the two wooden horses carved vivid and lifelike. Structural building surrounded by brick walls, and the wooden pillars are main bearing. Roofs are structured by horizontal and vertical slats arranged in a complex way, and be careful roofing by small tiles. Visiting this place, visitors have the opportunity to admire the decoration very sophisticated and beautiful. And feel a solemn worship space characteristic of East Asia.